On Friday's podcast, I opened the show reacting to the moves that were made (and weren't made) before Thursday's NBA Trade Deadline. Now that Anthony Davis remains in New Orleans, will the Boston Celtics land him this summer? And would Jayson Tatum be part of the package? What about Kyrie Irving's status after this season? The C's are about to have an interesting summer. Plus, I shared some afterthoughts on the Patriots' Super Bowl championship (42:00), discussed a huge MLB trade that made minimal headlines (52:45), and reacted to Kenny Omega choosing AEW over WWE (55:42). On Monday's podcast, Danny Picard opened the show with reaction to the Boston Celtics sweeping the Indiana Pacers while looking ahead to a second-round playoff series against the Milwaukee Bucks. Plus, Danny shared his thoughts on the Bruins forcing a Game 7 against Toronto, and the Red Sox sweeping the Rays in Tampa Bay. And he closed out the show with an NFL Draft preview, including what position he thinks the New England Patriots will target in the first round. On Thursday's podcast, Danny Picard took a look at the NFL schedule release, including what the New England Patriots have in front of them in 2019. Also, Danny shared his thoughts on the Patriots signing Demaryius Thomas (29:30). And he opened the show reacting to the Boston Bruins and Boston Celtics picking up big playoff wins on Wednesday night. Then there's the Boston Red Sox. Danny reacted to the Sox being swept by the Yankees in the Bronx, while breaking down some interesting comments made by Chris Sale and David Price (17:58). On Monday's podcast, Danny Picard reacted to Tiger Woods winning The Masters, the Boston Celtics winning Game 1 of their first-round playoff series with the Indiana Pacers, Nazem Kadri's cheap shot on Jake DeBrusk in the Bruins vs Maple Leafs series, Chris Sale starting in the Bronx, and a whole lot more. On Friday's podcast, Danny Picard opened the show reacting to the Boston Bruins losing Game 1 of their first round playoff series to the Toronto Maple Leafs, 4-1. Danny shares his thoughts on Bruins goaltender Tuukka Rask, and how he believes the time is now for Rask to earn his ultimate trump card. Plus, Danny gave his NBA Playoff predictions, and reacted to the Celtics losing Marcus Smart to an injury (26:12). Also, reaction to Magic Johnson stepping down as Los Angeles Lakers president of basketball operations (35:38). What happened? All that and more. On Monday's podcast, Danny Picard opened the show with his reaction to WrestleMania 35 and the G1 Supercard. Plus, Danny gave his Stanley Cup prediction, took an early look at the NBA Playoff brackets, and tried to figure out what's been happening with the Boston Red Sox. On Wednesday, Sports Illustrated pro wrestling insider Justin Barrasso joined Danny Picard in-studio to preview all of WrestleMania 35 and the G1 Supercard. We also reacted to John Oliver's HBO piece on the WWE's treatment of its wrestlers, looked ahead to what the future holds for AEW, and much more. On Thursday's podcast, Danny Picard closed out the show with his 2019 MLB predictions, from division winners to World Series champion (40:17). Danny opened the show discussing Conor McGregor's retirement, and reacting to audio of agent Drew Rosenhaus already discussing a comeback for his client Rob Gronkowski (15:41). On Monday's podcast, Danny Picard opened the show with his reaction to New England Patriots tight end Rob Gronkowski announcing his retirement via instagram. But it all comes with some questions. Is this really the end? Or are Gronkowski and his agent Drew Rosenhaus at it again? 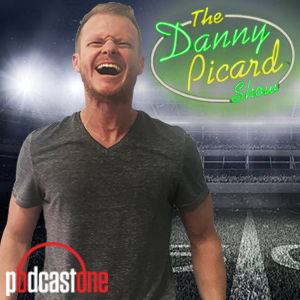 Also, Danny reacted to Chris Sale's five-year extension that he signed with the Boston Red Sox over the weekend (44:55), and how it's the exact same deal that was proposed on "The Danny Picard Show" last month. On Thursday's podcast, Danny Picard opened the show with reaction to Mike Trout's $430 million deal with the Los Angeles Angels, and discussed what he believes would be a fair contract for both Mookie Betts and the Boston Red Sox. Plus, Danny shared his thoughts on the Boston Celtics losing to the Philadelphia 76ers on Wednesday night, and explained why he actually enjoyed Marcus Smart's push on Joel Embiid, even though it might have cost the C's the game.